Good color and tight, concentrated tannins from the Walker Bay area are combined with spicy, intensely-flavored wine from Elim, to produce a wine full of flavor and complexity. Good color and tight, concentrated tannins from the Walker Bay area are combined with spicy, intensely-flavored wine from Elim, to produce a wine full of flavor and complexity. Intense aromas of green pepper, mulberry, rose perfume and spicy oak are present. 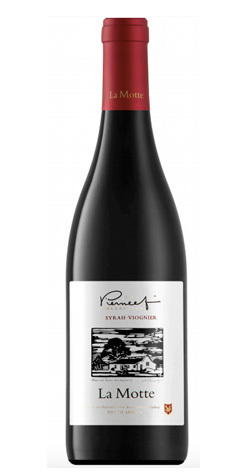 Soft, velvety entry with polished silky tannins lively and fresh on the finish. This red-and-white blend with its rich, fruity style is a versatile partner to food, as the structure and spice of the Syrah as well as the floral nuances of the Viognier allow it to complement beef, venison and charcuterie, aromatic curries, game birds such as quail and duck, as well as reduced fruit flavors. The preceding winter was wet and cold enough to ensure good and even budding. A hot August caused fast budding and an earlier season. The rest of the season was dry, windy and disease free, with no heat-waves – very positive factors. Due to climatic conditions, the harvest, that was large, lost moisture, enhancing concentration and eventually ensuring excellent quality. The yield of Cabernet Sauvignon was slightly lower due to windy conditions during budding. Analyses and flavors were promising. Grapes from the different Syrah vineyards were harvested at different times, but always together with some Viognier. The grapes were hand-sorted, followed by fermentation without stems. Regular pump-overs were done during fermentation at about 25 degrees Celsius. After about 25 days’ maceration, the free run and press wine were transferred together to 300-litre barrels and then matured for 14 months. 75% of the barrels were new. Blending took place and the wine was returned to barrels for another 4 months before bottling took place in November 2016. 13 500 cartons (6 x 750 ml) were bottled. From Anonymous of ALBUQUERQUE, New Mexico on 11/1/2018 .